Contains two books. One Listening and One Singing Book. Develop your listening and your singing ability at the same time you master the blues faster. If you really want to PLAY THE BLUES … you have to have it in your soul and IN YOUR EAR. How can you do the same, without spending a lifetime getting there? How can you get to the heart of the BLUES sound and play creatively within it? 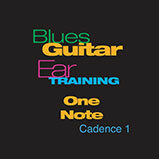 The Blues Guitar Ear Training One Note Book is the answer …. 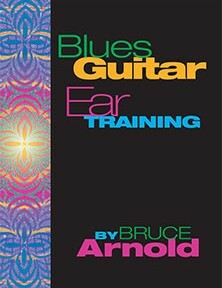 All it takes is a few minutes of your spare time each day listening to the Blues Guitar Ear Training MP3s. 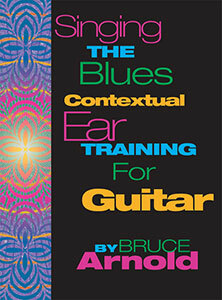 In this “Contextual” based ear mastery method, you will memorize the sound of the blues as you develop your ability to hear what each note sounds like in a key center. Mastering the Blues Key Center. The Blues has a highly specific key center based around a dominant chord 1,3,5,b7. Learning to identify this kind of key center is essential to hearing those classic blues licks and chord progressions. 48 exercises for each of the 4 turnarounds. You’ll be working directly with the sound of the blues which is essential to developing your ear mastery. 50% ability on Fanatic’s Guide to Sight Singing and Ear Training or Contextual Ear Training One Note exercise. Don’t forget this crucial side of ear training. Do you love to sing the Blues with all your heart and soul? Would you love to TOTALLY HEAR the Blues on a deep level? And be able to express everything you hear and love through singing the Blues? HEAR the Blues and translate that into your SINGING. modern pop music and developing your ear to hear within this context is the key to being a great blues musician. you the control and understanding to express everything you hear and love in the blues. Develop your ear an organic way. and Piano Trio. This will place you in a real bluesy situation and then prompt you to sing notes. A few minutes a day can make all the difference! memorize the sound of the blues and develop of your ability to sing each note within this unique key center. Five classic Blues progressions in all 12 keys. There are five Blues progressions found in this download. Each chord progression is found in all 12 keys. to keep you in that bluesy spirit. vocal technique etc… but an ear training method that requires you to sing pitches with a key center. What should I work on after Blues Guitar Ear Training? This entry was posted in Ear Training and tagged ear training, blues, singing, blues guitar, listening by Muse Eek. Bookmark the permalink.